iFixit has taken to its teardown tradition of breaking up the Apple devices. 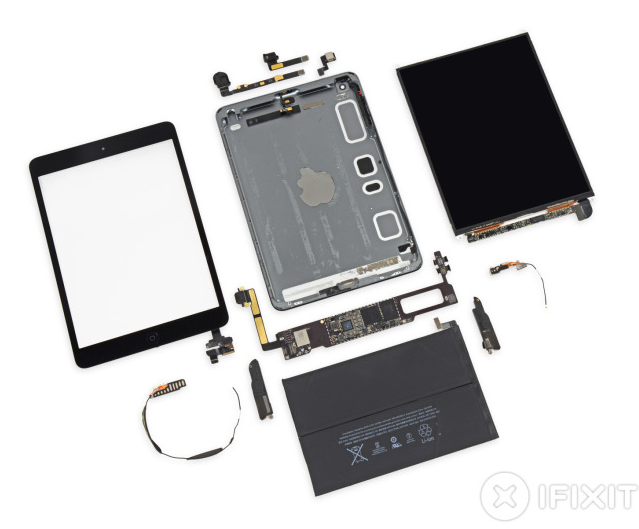 Following the teardown of iPad Air recently, iFixit has now taken its job to the Retina iPad Mini. Although it focuses on understanding the repairing of the devices, many more are simply interested to peek inside the these gadgets. Not quite a surprise, the new iPad Mini Retina is more of a cross between the iPad Air and the iPhone 5s. The Retina Mini’s 326ppi display is an LG one with a Parade DP675 LCD driver very similar to the DP655 of the Apple iPad Air. iPad Mini teardown also shows that the tablet has use same Broadcom touchscreen controllers prevously used in the iPad Air, iPhone 5 and the iPhone 5s. The latest from Apple, iPad Mini with Retina is a tiny little bit (0.3mm) thicker than the previous model to accommodate a much larger battery – 24.3WHr in place of the 16.3WHr of the previous iPad Mini. Which is understandably needed because of the much higher-resolution display. iPad Mini teardown also indicates that the chipset is almost identical to that used in the Air, but similar to iPhone 5s. The A7 chip is the version used in the iPhone 5s, rather than the slightly updated version used in the Apple iPad Air. This could be because of the face that smaller chassis can not allow as much heat dissipation as its bigger version. Top stories of the week you should check! Apple phablets, anyone? Apple to Introduce Larger, Curved Display iPhones in Q3 2014 with Pressure Sensors.